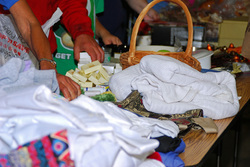 Feeding the Spirit is only one option in the Greensburg area that helps those in need. One of the distinguishing features of Feeding the Spirit is that because we accept no government funding, we are at liberty to assist anyone and everyone, without restriction or limitation. However, because we are a grassroots organization and must be mindful of our spending, we endeavor to work in conjunction with other organizations who are equally committed to serving the homeless, marginalized and disenfranchised in our community in order to avoid duplication of services. ​If you are in need of assistance and don't know where to turn, contact pa211.